He strutted, he gobbled and he puffed up his feathers like his life depended on it. And it did. The turkey's outgoing personality and good looks helped spare him from the Thanksgiving plate. The bird, named Tom One, was chosen for a presidential pardon. It was chosen from a dozen finalists at a Northern California farm. The bird will board a flight called Turkey One in San Francisco to head to the White House ceremony with President Barack Obama before the holiday. After that, he will be sent to live at a farm in Virginia. Picking the lucky gobbler wasn't easy. 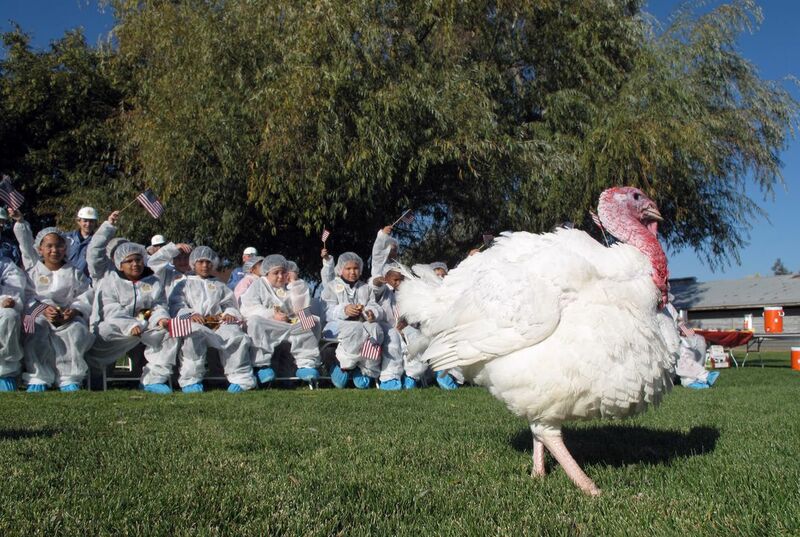 He was among a dozen birds vying for the pardon at a Foster Farms ranch in Modesto, California. A class of fifth-grade students in attendance cheered on the show. "I think that bird is going to be lucky for the rest of his life, man," said Angel Avila, a 10-year-old student at Eisenhut Elementary in Modesto. As the students watched and shouted for their pick, Foster Farms manager Joe Hedden and his team inspected the birds. They put each on a stand and ran their hands over the feathers, body and head. "We want to present the president with a well-mannered and socially skilled turkey that's going to act right on the big day," he said. The first turkey was officially granted a presidential pardon in 1989 by President George H.W. Bush. It started an annual holiday tradition. 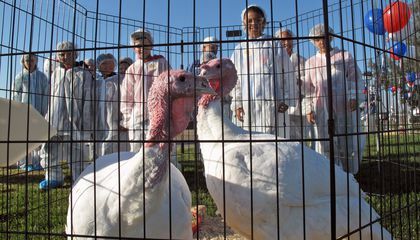 Foster Farms won the honor of providing this year's turkey. They chose the best one, and an alternate, called Tom Two. Hundreds of students from throughout California sent in their suggested names for the turkeys. They will be given their formal names at the White House. Ira Brill is Foster Farms' director of communications. He said the pardoning ceremony symbolizes a rare time when Americans come together. "I think it's really an opportunity for any president - whatever his party - to reach out to the American public," Brill said. "This is one of the few days that we all share something in common." WOW! I wish that I can see a turkey like that. And I have also seen a lot of cooked turkey not alive ones. But because the turkey had a good manner and a good personality it must have been a special one. So maybe it must have been trained. I wish that I can have a turkey like that. Maybe I will get one and teach it those kind of stuff like to have good manners. I think this is cool because I never knew that a turkey selection for a presidential pardon existed. I wonder what the criteria are to win the selection. It must have been hard to choose a turkey that would behave. The key criteria for the selection is personality. There were looking for white feathers. The key was to be careful what you read and it was easy. The key criteria for the selection was to pick the best bird out their and they want it to be perfect. The bird goes to the white house and shows the president what it can do. When they picked out the right bird it was really hard for them because their was so many birds and they wanted the right one. They wanted a bird with perfect white feathers. The key was that they were looking for white feathers. It sounds like this turkey really had to strut its stuff to survive.